Here’s a look at the latest pod system device from Vaptio. It’s called the Vaptio Solo-Flat and is a follow up to their C-Flat pod system that came out last year. It’s aimed towards low power, high resistance and high nicotine vaping. Which seems all the rage these days with the recent boom of pod system devices and salt based nicotine. 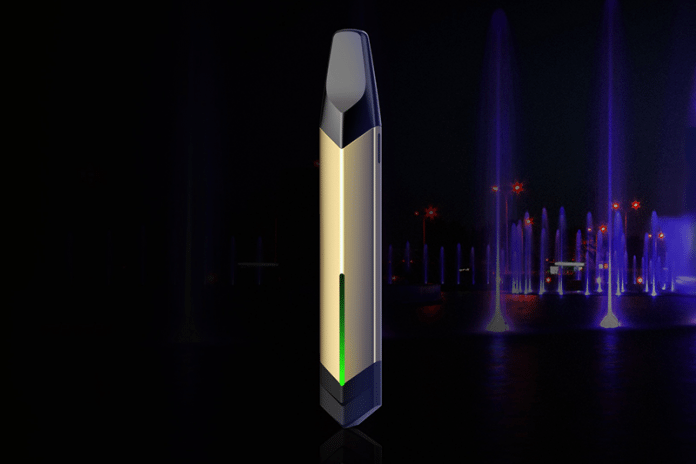 The Solo-Flat is a compact all-in-one pod system device that’s geared towards high nicotine liquids. It’s a little bit slimmer but also a little bit longer. It’s got a unique shape that’s sleek and stylish with an LED indicator that lights up like a fountain. The LED is dual purpose. Not only does it add some visual appeal but it helps to indicate when it is firing and shows the remaining battery level. The LED flashes after each fire of the device with the speed and intervals indicating the remaining battery. A long steady flash indicates a full battery while faster intervals of flashing indicates a declining battery. On the side of the device is a micro USB port for charging and with the 650mAH internal battery it’s fully charged in two hours or less. It’s got a duckbill mouthpiece which they call a drip tip. Much like the C-Flat, it’s a proprietary piece that won’t fit other devices nor can it be replaced with your own. It’s super comfortable and stays in place better then it’s predecessors wayward tip. I’d still prefer a standard 510 tip or one that’s incorporated into the pod itself so there’s one less piece to potentially lose. To use the device you first need to fill up the tank via the little rubber stopper. Let it prime for a few minutes and then just press the tip to your lips and take a pull. No button or anything, it’s draw to activate and works just like a cigarette would. Sporting an improved airflow control chip it now fires pretty much instantly when taking a hit. So new vapers looking for a similar experience to a cigarette should feel right at home. The pods have built-in coils which can’t be replaced so when it burns out you’ll need to replace the entire tank. The tanks hold 1.5ml of liquid, are relatively easy to fill and the kit comes with two of them so you can swap flavours. The pods slide into the end of the Solo-Flat mod and are held in place by friction and some little tabs. There are cutouts on each side to help you see the liquid level in the pod but it’s quite difficult to actually get a gauge on it without taking the pods out. Performance wise it does a good job with thinner liquids and higher nicotine but tends to struggle with thicker liquids. Flavour feels just a touch muted for a mtl device but not bad by any means and vapour production is a bit light. Often I needed to take two pulls for it to get going and deliver a decent hit but after that, it seems fine. I’ve mainly been using it with some 50/50 40mg salt based liquids and it’s provided with a pretty decent experience overall. Will I keep using this thing? I’m afraid once the coils burn out this one will likely end up on the shelf. Who do I think this is for? I think it’d work best for new vapers looking for an experience that’s similar to a cigarette, that is convenient, compact and works well with high nicotine liquids or for seasoned vapers looking for a simple kit to get back in to high nicotine liquids.